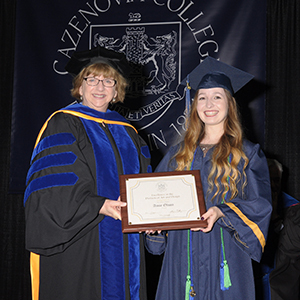 Cazenovia College's 193rd Commencement ceremony on Saturday, May 19, featured several academic awards, recognizing the achievements of outstanding students in the 2018 graduating class. These individuals received the following awards. The Valedictorian of the Class of 2018 is Shiloh Wood. Wood is an outstanding Human Services student with a GPA of 3.992, specializing in Counseling and Mental Health with a minor in Psychology, and she is also an All-College Honors student. Wood has amassed a long list of awards and honors over the past four years, but in just the last two weeks, she has received the All College Honors award for her academic achievements, the outstanding human services program award for all her accomplishments in Human Services, the senior essay contest, the Alpha Lambda Delta honor society award, and the Genung student life award. Wood's senior capstone research focused on the need for education regarding mental illness in order to reduce the stigma of this disease. She defended her thesis at the all college honors program, convincing the audience that we need education and awareness programs in all of our high schools. In addition to her academics, Shiloh has been very involved on campus, as a Resident Advisor, the Secretary for the All-College Honors Program, and an officer in the Human Services club. She has also been inducted into five national honor societies: Alpha Chi, Sigma Alpha Pi, Tau Upsilon Alpha, Psi Chi, and Alpha Lambda Delta. Beginning in August, she will be the Program Coordinator for the Cazenovia College Inclusion program, working with adults with intellectual disabilities. Her goal is to attend graduate school for Clinical Mental Health Counseling in the near future. The Academic Excellence Award in the Division of Art & Design was awarded to Amie Olson of Newport, New York. Olson's work in the studio and classroom has set the standard for her peers. She has honed her creativity and technical skill to create art and designs of exemplary uniqueness and attention to detail. Olson's garments have been on the runways of the annual Cazenovia College student fashion shows and Syracuse Fashion Week. Her internship as assistant wardrobe manager for the Sterling Renaissance Festival provided the opportunity to create costumes for interactive theatre actors. She says her experience at Cazenovia has deepened her passion for creating and pushing the boundaries from historical designs to modern fashions. Her capstone research paper and accompanying fashion design collection, The Modern Viking, exemplified this passion. The Academic Excellence Award in the Division of Business and Management was awarded to Lillian Boyd, of Colrain, Massachusetts. She was a business management student, pursing a concentration in Accounting, a specialization in Equine Business Management, and a minor in Marketing, while maintaining a 3.75 GPA. An internship at Farm Credit East last summer resulted in a job offer where she will start full-time work upon graduation. During her senior year, she also worked part-time at Farm Credit East. The company was so impressed with her abilities that she was allowed to take, and passed, Farm Tax Courses 1A and 1B, the first part-time employee in over ten years to do so. 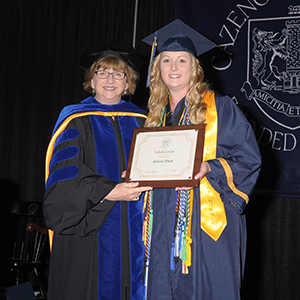 In addition to balancing her full-time course load, she was a member of the Equine Ambassadors Club for all four years at Cazenovia College, and served as Vice-President this year. She also worked as a farm hand, gaining practical experience with the day-to-day workings of the farm. Her duties ran the breadth of operations from actual barn work, to marketing and financial responsibilities. Upon graduation, she will start the fulfillment of her aspiration, working with small farms to help them succeed. 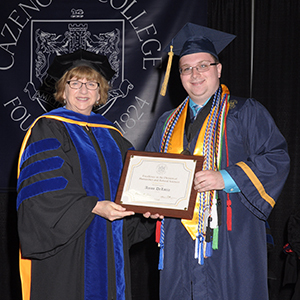 The Academic Excellence Award in the Division of Humanities and Natural Sciences was awarded to Aaron DeLoria, of Newcomb, New York. DeLoria has distinguished himself as an engaged, curious, committed student. As a Communication Studies major, who has also minored in business and pre-law, he has both excelled academically and enhanced campus life. While earning an impressive 3.99 GPA as an All College Honors Student, he has also been a resident advisor for three years, and a writer and editor for the student newspaper, The Quad. DeLoria also is named this year's Salutatorian. In addition to his outstanding academics, he has participated in a variety of organizations, including three honor societies - Alpha Lambda Delta, Lambda Pi Eta, and Alpha Chi - and two service societies - Sigma Alpha Pi and Alpha Phi Omega. He has also been a member of two clubs - the Human Services Club and the Women’s Empowerment Club. He will begin graduate work at Syracuse University in the fall. These studies will complement his passion for film, journalism, and social justice, preparing him for his intended occupation as a screenwriter and director. 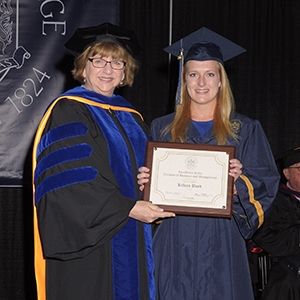 The Academic Excellence Award in the Division of Social & Behavioral Sciences was awarded to Kristen Fuller of Truxton, New York. This award goes to a student with outstanding academic performance as well as a commitment to Cazenovia College through extracurricular activities and service. This year's award winner is an Inclusive Elementary Education student with a psychology minor. She is a member of Sigma Alpha Pi, Pi Lambda Theta, Alpha Chi, and Alpha Lambda Delta. She has won awards such as the Softball Coach’s Award, Who's Who Among Students, and Outstanding Leader Scholar. On top of her academic achievements, she is on the softball team, is a member of numerous clubs, and is a psychology tutor. She has an extensive list of volunteer experiences as well, including various community service events in Cazenovia in addition to activities with the THANCS Community Service Club in Homer. 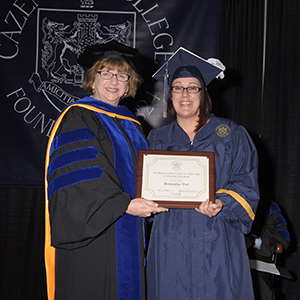 The Academic Excellence Award in the Center for Adult & Continuing Education was awarded to Samantha Vail of Ilion, New York. 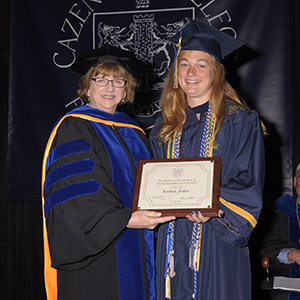 Vail is one of the first students to graduate from Cazenovia's off-site Education programs offered at Herkimer College. She is highly motivated and committed to excelling at her coursework while balancing her family responsibilities. Her professors comment that she is a leader in and out of the classroom. Not only does she serve as a role model for her peers, but she has a love of learning that is contagious. During her student teaching placements, her host teachers echo this praise in sharing that "she is a huge asset to my classroom as she has given me new ideas and encouraged my excitement for the new year to start," and that "she will make a GREAT teacher." Not only has she excelled with her coursework and student teaching, but also she has participated in each of the community service opportunities. During the volunteer opportunities, she goes above and beyond in her interactions with children and their families. She cares about every student and teaches from the heart! 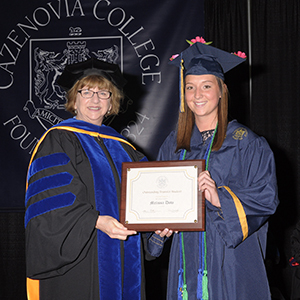 The Academic Excellence Award for Outstanding Transfer Student was awarded to Melissa Dow of Fabius, New York, who came to Cazenovia College from Onondaga Community College. Dow is a Human Services student who has excelled academically with an impressive GPA of 3.93. She is a member of three honor societies, Tau Upilson Alpha national honor society, Alpha Chi National honor society, and Phi Theta Kappa. Dow received the Human Services outstanding senior capstone award for her well-researched forty plus page capstone on the lack of mental health services for juvenile offenders. Her analysis of this issue was thorough and convincing with clear evidence to support her thesis that we need more mental health interventions for teens. She also completed an internship with Madison County Community Action Partnership mentoring children in need. Her supervisor described her as "an outstanding student who wants to make a difference for those in need who cannot advocate for themselves." Her goal is to continue on for her Master's degree and work with juvenile offenders providing them with appropriate mental health services in order to reduce their incarceration rates.